Join us on the ride to discovering more about how business can become carbon-neutral! In this series, we explore all the work that goes into it and build a framework and inspiration for other businesses to do the same. Thankyou Payroll recently signed our support of the Zero Carbon Act as we are committed to being an environmentally responsible business. We’re interested in partnering with other businesses to take part in carbon reduction. ActionStation, Thankyou Payroll and volunteers digging in the gully. 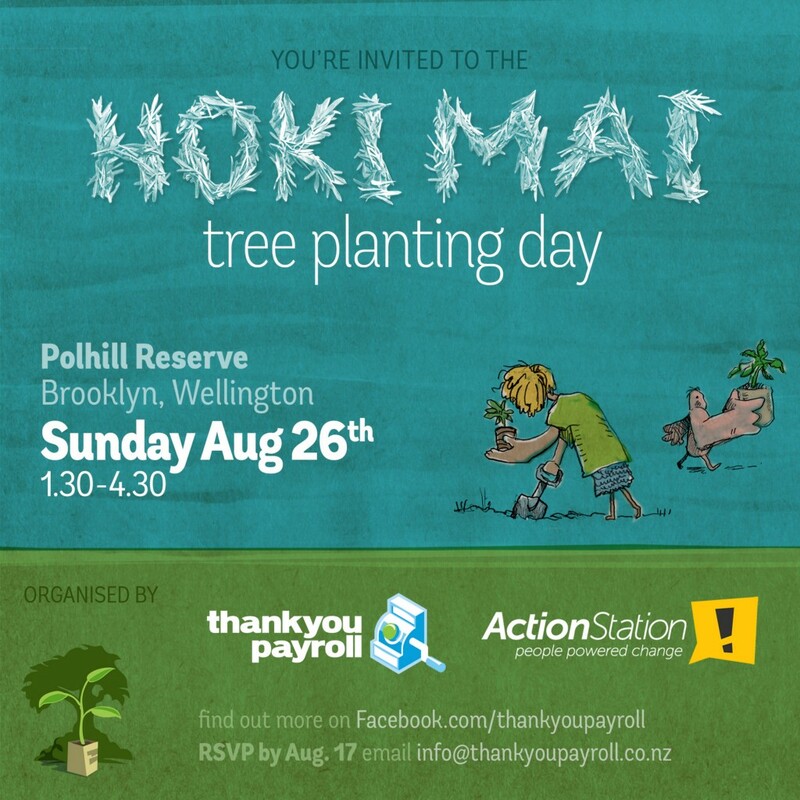 We organise an annual tree planting event, helping to offset the emissions we use for our business operations. This year, we partnered with ActionStation and invited our clients and partners so we can make a bigger impact and encourage others to take action. In the past, those events have been in Dunedin. This is the first year in Polhill Reserve, Wellington, closer to our HQ. 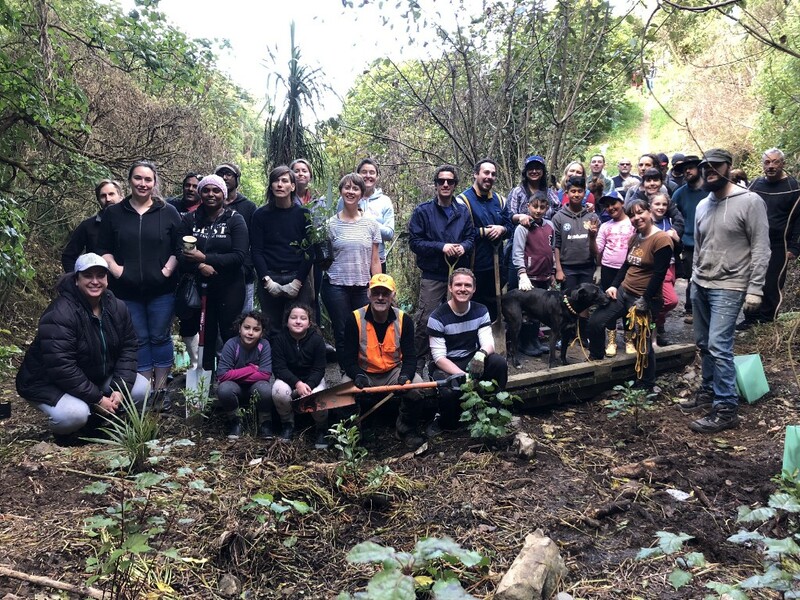 Polhill Reserve is where the native bush is returning to central Wellington, near an old slip site where thick blackberries and gorse once dominated. They’ve been cleared, and native forest is being planted, including heroes like miro, matai, rimu and nikau. Polhill Reserve is part of the townbelt between Brooklyn, Highbury and Aro Valley. This area use to be farmland only 60 years ago, but is now regenerating native forest. It’s also a popular recreation area. The tracks that were built by mountain biker volunteers are amongst the most well-used in the city. It’s also home to more and more native birds, including kaka and the rare tieke (saddleback), thanks to the local trapping group. Polhill is a Wellington gem — full-on nature, only minutes from cafes and craft beer. Our business is carbon neutral accredited by Ekos, but we are continuously looking at ways we can reduce our footprint. From our procurement policy to our robust waste minimisation process, we wanted to find a way to also involve everyone: employees, clients and community. Planting trees together also takes us out of the office environment and boosts team building. Everyone had a chance to get very dirty and loved it! Planting native trees and bush is very important because it brings back the birds and makes our environment more resilient. 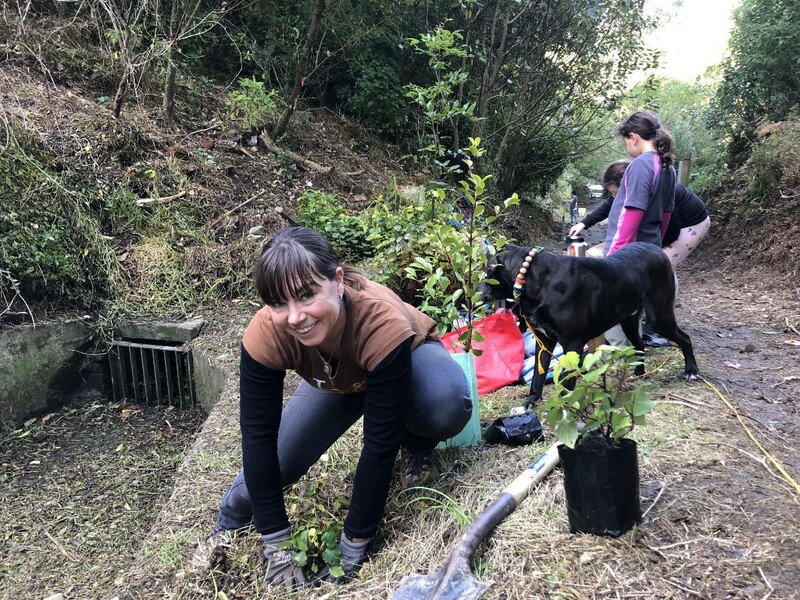 This reserve in particular has a rich history as a important water catchment for Wellington City, directing storm water back to the city from the hills. There is even talk of one day restoring the kiwi bird to the Capital! “This looks aaaahhhhmmaaaaazzzzing!! I love being outside!”, young volunteer. Digging is tough work so we’d also like to thank La Boca Loca, our awesome customer, for supplying the volunteers with vegan empanadas and spicy hot chocolate on the day! Fuel helped us dig even deeper to make a difference. CEO, Christina Bellis, getting down and dirty. After last year’s carbon neutral certification, we started searching for ways to sink beyond carbon neutral. Tree planting is one way. Stay tuned on new ways we are discovering we can make small changes and big differences. We love sharing our learnings with others and showing how any business can do the same. To get involved in future tree-planting or volunteer days, follow our Facebook page. To sign the Zero Carbon Act and get your company involved, check out their page here. Businesses On the Road to Zero: Part 1 was originally published in Thankyou Payroll on Medium, where people are continuing the conversation by highlighting and responding to this story.